Things are very different form how there were in the 1950s. But we can all learn a little for reading about being a good housewife in the 1950s. 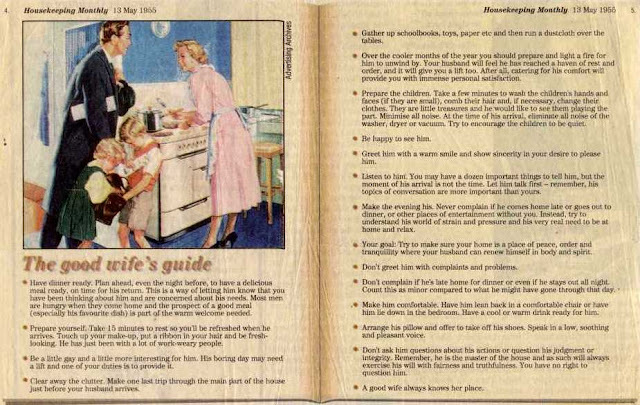 The "Good Wife's Guide" is a magazine article rumored to have been published in the May 13, 1955 issue of Housekeeping Monthly, describing how a good wife should act, containing material that reflects a very different role assignment from contemporary American society. Have dinner ready. Plan ahead, even the night before, to have a delicious meal ready, on time for his return. This is a way of letting him know that you have been thinking about him and are concerned about his needs. Most men are hungry when they come home and the prospect of a good meal is part of the warm welcome needed. Prepare yourself. Take 15 minutes to rest so you’ll be refreshed when he arrives. Touch up your makeup, put a ribbon in your hair and be fresh-looking. He has just been with a lot of work-weary people. Gather up schoolbooks, toys, paper etc. and then run a dustcloth over the tables. Prepare the children. Take a few minutes to wash the children’s hands and faces, comb their hair and, if necessary, change their clothes. They are little treasures and he would like to see them playing the part. Minimize all noise. At the time of his arrival, eliminate all noise of the washer, dryer or vacuum. Try to encourage the children to be quiet. Listen to him. You may have a dozen important things to tell him, but the moment of his arrival is not the time. Let him talk first-remember, his topics of conversation are more important than yours.